The weather conditions were excellent for the last day of racing which saw the sixth and final race take place under sunny skies in a fresh 18 to 20-knot north-easterly wind. The participants tackled a 12-mile course: the first boat across the line, in fact, was Sophie and her Swiss crew (Pedro Andrade, Martin Westerdahl, Diogo Cayolla) followed by Alfie of Great Britain (Lawrie Smith, Adam Bowers, Joost Houweling) and Drago of Portugal (Jose Sotto Mayor, Gustavo Lima, Frederico Melo). 3. Dejavu (Ukraine): Sergiy Pichugin, Sergiy Scherbakov, Igor Severyanov. The complete standings are available online at www.yachtclubsanremo.it. A total of 23 nations were represented: Antigua, Australia, Austria, Denmark, United ArabEmirates, Estonia, Finland, France, Germany, Great Britain, Hong Kong, Ireland, Italy, Monaco, Norway, Holland, Portugal, Russia, United States, Sweden, Switzerland, Ukraine and Hungary. 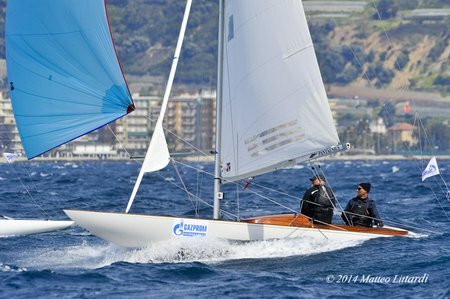 Some of the top names in Italian sailing competed at Sanremo. British sailor Lawrie Smith – whose achievements have included a bronze medal in the Soling at the 1992 Barcelona Olympics, three editions of the Whitbread and the America’s Cup in 1983 at the helm of Victory – was aboard Alfie. German Olympic sailor Vincent Hoesch – World and European Champion in various classes including the Dragon, Star and H-Boat – was competing aboard Sinewave. German Markus Wieser – who in 2013 took victory in the International 5.5-metre World Championship and third position in the Dragon World Championships – was aboard Bunker Queen. Marc Bouet – who was Soling World Champion in 1991, competed in the 1992 and 1996 Olympics and helmed Ville de Paris and Cap Harmonie in the America’s Cup – was sailing aboard Irina. The Gazprom International European Dragon Championship is being staged in partnership with Gazprom International and BMW (main partners of the event), and Paul&Shark, Transbunker, Ulysse Nardin, Pantaenius Yacht Insurance, Comune di Sanremo, Royal Hotel Sanremo, Regione Liguria, Casino di Sanremo, Gruppo Cozzi Parodi.